You don't know what you're missing until it is taken away from you. Lorraine Hunt Lieberson died in the summer of 2006 after a struggle with breast cancer, and since then, several CDs featuring her singing have been released – CDs that might not have come on the market if Lieberson were alive today. Is this exploitation? Not at all. Without exception, what has been released has presented her in the best light. The sad truth is, now that we know that she's gone, we want to console ourselves in her absence with as many souvenirs of her singing as we can. This one was recorded on July 9, 2004 at the Caramoor Festival in New York State. The New York Festival of Song was founded in 1988 as a sort of moveable feast of great songs, great songs, and visionary leadership – both behind and away from the piano bench – by Steven Blier and Michael Barrett. On that occasion, as Blier relates in Bridge's booklet note, he and Lieberson had briefly discussed recording this program in the recording studio, but the opportunity did not present itself, and all too soon, Lieberson's time ran out. Fortunately, the Caramoor recital had been recorded, and that is why we have this CD. "No retakes," writes Blier, "no edits, no second thoughts, no cosmetic touchups, just the spontaneous collaboration of four musicians on a night whose unique importance we then dimly recognized." Lieberson was in excellent voice on this night, and that's saying a lot, because her voice was an opulent instrument. It also was a versatile one; it could negotiate the rigors of Bach, Handel, and Mozart, but it also could relax and bend itself to the more subjective demands of the romantic and modern repertoires. In the opening song, Granados's El mirar de la maja ("The gaze of the maja"), Lieberson sings about eyes aflame with a passion so intense that they burn the object of her gaze. She finds the equivalent to that gaze in her voice, and the listener is transfixed. There's more to this recital than burning intensity, however. In Chabrier's España, for example, she's obviously having the time of her life… and so is the audience. Lieberson was a joyous performer, and there is such joy in hearing her sing these songs. Joseph Kaiser is a young American tenor for whom big things are beginning to happen, including the role of Tamino in Ken Branagh's new film of The Magic Flute, and a Met debut in 2007 as Roméo in Gounod's Roméo et Juliette. His voice is light, bright, and strong, and he sings both ardently and with charm, although Lieberson's vocal presence towers over his. Blier and Barrett accompany the singers stylishly. These are pianists who really understand what it means to collaborate, and what it takes to get to the core of a song. Bridge's exemplary booklet contains remembrances of Lieberson by both pianists, Blier's essay about the repertoire, and complete sung texts and translations. (All translations are by Blier – is there no end to his talents?) 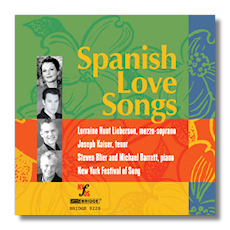 The recording includes thumps, thuds, and other artifacts (mostly audience-related, I think), but really, it's the next best thing to having been there for real, and even listeners who don't respond to song recitals might find themselves liking these "Spanish Love Songs" a great deal.